Check each distribution-specific page for supported versions, special installation steps or restrictions. Running Data Preparation recipes on Hadoop is only supported if the cluster runs Java 7 or later, which might not be the case for older installations. DSS does not provide support for custom-built Hadoop distributions. The host running DSS should have client access to the cluster (it can, but it does not need to host any cluster role like a datanode). the Hadoop client libraries (Java jars) matching the Hadoop distribution running on the cluster. the Hadoop configuration files so that client processes (including DSS) can find and connect to the cluster. Both of the above operations are typically best done through your cluster manager interface, by adding the DSS machine to the set of hosts managed by the cluster manager, and configuring “client” or “gateway” roles for it. If not possible, installing the client libraries usually consists in installing software packages from your Hadoop distribution, and the configuration files can be typically be downloaded from the cluster manager interface, or simply copied from another server connected to the cluster. See the documentation of your cluster distribution. The above should be done at least for the HDFS and Yarn/MapReduce subsystems, and optionally for Hive and Pig if you plan to use these with DSS. You need to have access to one or several writable Hive metastore database (default “dataiku”) so that DSS can create Hive table definitions for the datasets it creates on HDFS. You must have a running Hiveserver2 server. Several Hive security modes are supported. See DSS and Hive for more information. First, test that the machine running DSS has proper Hadoop connectivity. It should display version information for your Hadoop distribution. If you want to run Hive recipes using “Hive CLI” mode, you need a properly configured “hive” command line client for the DSS user account (available in the PATH). If it succeeds, and lists the databases declared in your global Hive metastore, your Hive installation is correctly set up for DSS to use it. If your Hadoop cluster has Kerberos security enabled, please don’t follow these instructions. Head over to Connecting to secure clusters. If your Hadoop cluster does not have security (Kerberos) enabled, DSS automatically checks for Hadoop connectivity at installation time, and automatically configures Hadoop integration if possible. You don’t need to perform the dsadmin install-hadoop-integration step. You still need to perform Hive and Impala configuration, though. You should reconfigure Hadoop integration using the above procedure whenever your cluster installation changes, such as after an upgrade of your cluster software. 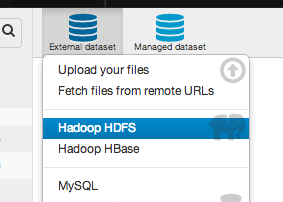 If the Hadoop HDFS button does not appear, Data Science Studio has not properly detected your Hadoop installation. You can then select the “hdfs_root” connection (which gives access to the whole HDFS hierarchy) and click the Browse button and verify that you can see your HDFS data. Upon first setup of DSS Hadoop integration, two HDFS connections are defined: “hdfs_root” for read-only access to the entire HDFS filesystem, “hdfs_managed” to store DSS-generated datasets. You can edit these default connections, in particular their HDFS root path and default Hive database name, to match your installation. You can delete them or define additional ones as needed. For DSS to be able to read and write Hive table definitions, you must setup the host of your HiveServer2. Go to Administration > Settings > Hive, enter the host name of your HiveServer2, and save settings. If you want to run Hive recipes using “Hive CLI” mode, you also need a properly configured “hive” command line client for the DSS user account. If your Hadoop cluster has Impala, you need to configure the impalad hosts. Go to Administration > Settings > Hadoop, enable Impala, enter the list of Impala servers (if none is set, then the localhost will be used), and save settings. For more information, see DSS and Impala. To run Pig recipes, you need to have the Pig packages installed on the host running Data Science Studio. It is required to have the “pig” command in the PATH. If Pig was already installed when you installed Data Science Studio, connectivity to Pig is automatically set up. Connecting to secure Hadoop clusters requires additional configuration steps described in Connecting to secure clusters.